My dining room window looks out on to my wide, deep front porch. As such, it’s sheltered from the elements, and I haven’t closed it once since the warm weather arrived. As Sean and I ate dinner last week, I noticed something on the top of the window – a dark lump, like a large piece of dirt. I walked over to take a closer look and noticed that there was a bird inside the lump, and that the lump was actually a nest. French Bulldogs are not known for being the most agile of animals. To be honest, your average Frenchie has a hard time climbing on to the couch, let alone climbing an obstacle. As with all things, however, there are exceptions. Years back, I owned a gorgeous little brindle pied girl named Chicky. She was a wonderful dog, and the love of my daughter Nicole’s life. Unfortunately, she was also an escape artist – Chicky could climb fences. The first time a neighbor told me that they’d seen her do it, I thought they were nuts. “Frenchies don’t climb fences” I muttered to him, and then spent the rest of the afternoon patrolling the fence and looking for holes. It took seeing her myself as she went over it to convince me that he wasn’t kidding, and to phone a fence company to come out and fix the area she’d been climbing – a spot where the chain link was pushed up against a tree, allowing her to get a foothold and catapult herself to the top. Unfortunately, the fence repair company never had a chance to come out – it took less than 24 hours after that first time I’d seen her for her to climb it, one more time, and drown in my other neighbor’s pool. Now I never assume a Frenchie can’t climb. Now I assume the opposite – that they can – and plan accordingly. When we purchased our new house, I spent thousands having it securely fenced before we’d ever moved in. Tight bottom lines, pegged to the ground. Top rails. Heavy gauge wire. Height a foot higher than I could conceivably need for Frenchies. Separate areas around the pool, off the dog room, under the deck. We were set – or so I thought, until I found Tula skipping along behind me as I went out to the barn to empty the trash cans. I knew she’d gotten out somehow, but I couldn’t figure out how, or where. It took me one afternoon to find it, and hopefully to fix it. 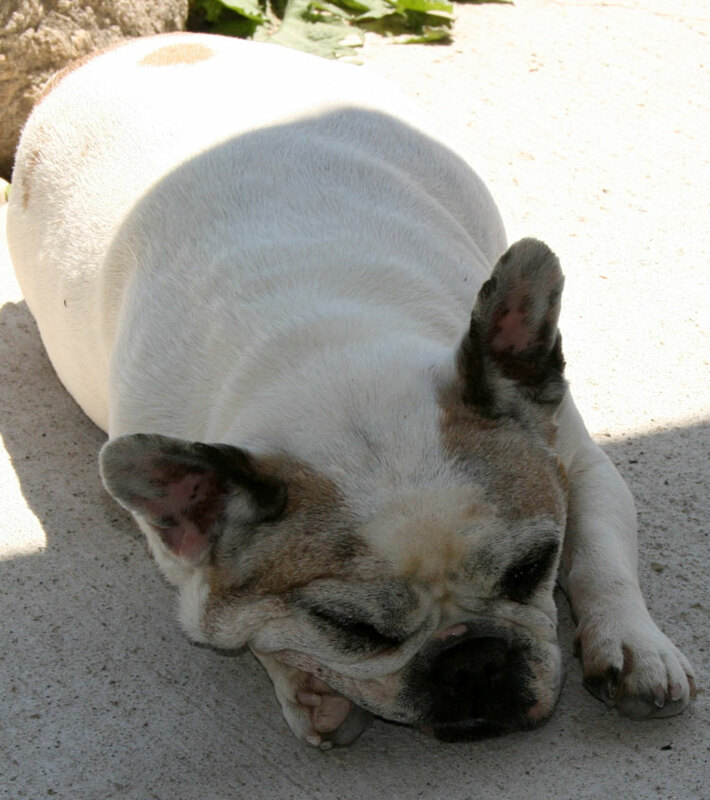 French Bulldog Websites… a LOT of French Bulldog websites! OK, there comes a time when you wake up and realize “Holy crap. I need to get a life.” For me, that moment came when I sat down and really took a look at how many French Bulldog websites I have created. It started out simply enough – we shared info space on bulldog.org *, which was one of – if not the – very first dog info pages on the web. 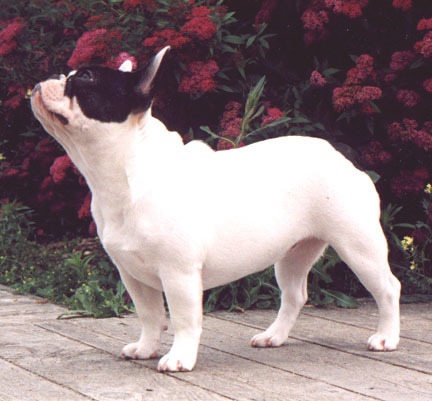 This morphed into a stand alone French Bulldog informational site, with my kennel tacked on as an afterthought. Then, I decided that having my kennel info included on a .org site was unethical, since the very intent of .org domain names is that they are non profit. With this in mind, I created our first .com kennel website, almost seven and a half years ago. Due to a combination of timing and inattention, I lost our first Frenchie specific domain name, so created a new site, which focused more on games and fun. https://i0.wp.com/www.bullmarketfrogs.com/wp-content/uploads/2015/04/Brindle_pied_frenchbulldog.jpg?fit=662%2C662 662 662 frogdogz http://www.bullmarketfrogs.com/wp-content/uploads/2015/06/bullmarket-logo.png frogdogz2007-06-22 13:52:322007-06-22 13:52:32French Bulldog Websites... a LOT of French Bulldog websites! I have been thinking lately about the concept of ‘placing’ older dogs. ‘Placing’ is synonymous with ‘retiring’ – it means that we find good, loving, preferably close by homes for our older girls or boys who are no longer active in our breeding program. The theory is sound – dogs who have had to be part of a pack get to be a solo dog, or perhaps one of two dogs. This means increased attention, and perhaps a chance to sleep on the bed. In practical terms, this also leaves room for new puppies to be kept as the future of our breeding program.